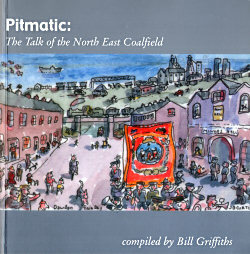 Pitmatic is a vernacular once used by miners in the north-east of England. Its name is hardly known even in the area in which it was once best known, though it has received attention from dialectologists and was featured in Melvyn Bragg’s The Routes of English BBC Radio 4 series back in 2000. It was in the news in 2007 as a result of the publication of a book on it by Bill Griffiths. It was the language of colliers and pitmen, miners in the coal seams of Durham and Northumberland, once the capital of coal (not for nothing was the saying carrying coals to Newcastle coined to refer to a useless undertaking). It has gradually died out as the deep pits of the area have progressively closed. Pitmatic is full of mining terms: at bank, on the surface; cavil, to choose your underground coal hewing station by lot; hoggers, footless socks that made it easy to clean coal from between the toes, later a type of flannel drawers; cracket, a stool on which a pitman sat while hewing coal; kenner, the end of the shift; and arse-flap, a loop attached to the winding rope in a shaft on which a man sat while carrying out repairs. Many of the terms can be traced back to Scots, Old Norse and Low German. Trying to classify it isn’t so easy. It isn’t a dialect, because it’s principally vocabulary, lacking grammatical features that separate it from other types of speech (the main dialect of the area is the one commonly called Geordie). It isn’t just a workplace jargon, though that’s where it comes from, because some of the terms have escaped into the wider community, such as greaser, a device to lubricate the wheels of the coal tubs, which led to the expression “gan canny ower (go carefully over) the greaser”, meaning “mind how you go”; It can’t be called an argot, which is a semi-secret vocabulary with criminal associations, or a patois, which is a low-status dialect, which Pitmatic certainly wasn’t. Call it a vernacular. That fuller form, Pitmatical, soon abbreviated, gives the clue to its origin. It’s a compound of pit and mathematical, which may have been intended to stress the skill, precision and craft of the colliers’ work.